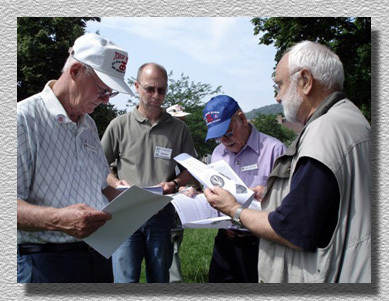 On 12 June, 2007 it happened again: an American tour group with six veterans from the 90th Infantry Division came to Dillingen to visit the place of their engagement (almost 63 years ago) again – three of the veterans have been even in combat in Dillingen and Pachten. 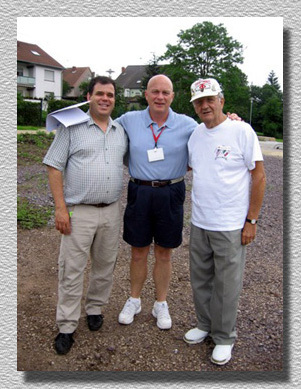 Friends from the French organisation »Moselle River 1944« of Metzervisse (France) looked after the group. The French had got in touch with the Geschichtswerkstatt a couple of weeks before and requested assistance during the Dillingen visit. Unfortunately there was not much time, because the group had another appointment at the Luxembourg American Military Cemetery at Hamm (Luxembourg). 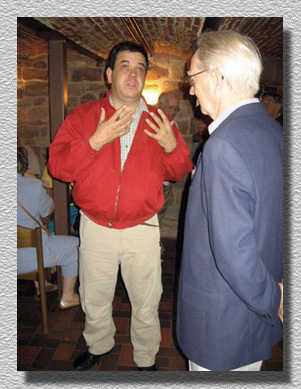 At about 10.30 hrs the Americans were welcomed with a very moving speech by town councillor Guenther Mueller in the basement of the Pachten Museum. After that the group drove by bus to Pillbox WH 20 in the Annastrasse, where our guests had the chance to take a look inside a Siegfried Line pillbox – Johannes Draeger guided the group. Outside the pillbox very interesting conversations with the veterans developed and many memories from the time 63 years ago came up. Before we had lunch in the »Felsmuehle« restaurant we made a stop at Pillbox WH 11, so that even those who had not experienced the Second World War themselves could get an idea oft he severity of the fighting in Dillingen. As a memory of their visit Armin Jost, Johannes Draeger and Stefan Reuter presented signed copies of the two Geschichtswerkstatt’s publications to the six veterans in the »Felsmuehle« restaurant. 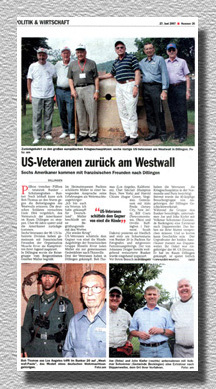 Referring to the veterans‘ visit two newspaper articles were published, in the »Wochenspiegel« as well as in the »Saarbruecker Zeitung« (see below). 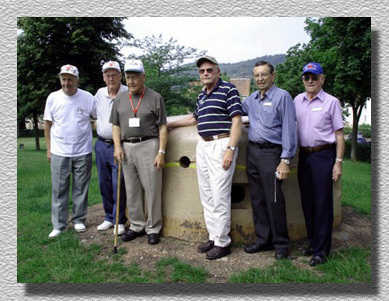 The veterans at the turret of Pillbox WH 20 (left to right): Aldo Freda, Orville Buffington, Harold Choate, Chet Sinclair, Bob Thomas and Bill Couts. Orville Buffington, Stefan Reuter, Bill Couts and Pierre Filine in conversation at Pillbox WH 20. 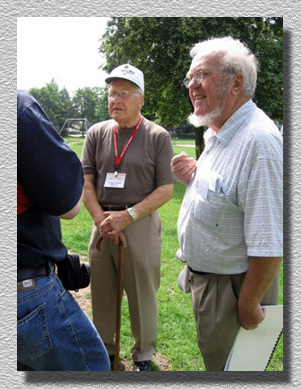 Harold Choate and Jacques Kleiser at Pillbox WH 20. Pascal Moretti and Guenther Mueller in the Pachten Museum. Pascal Moretti, Norm Richards and Aldo Freda at Pillbox WH11. 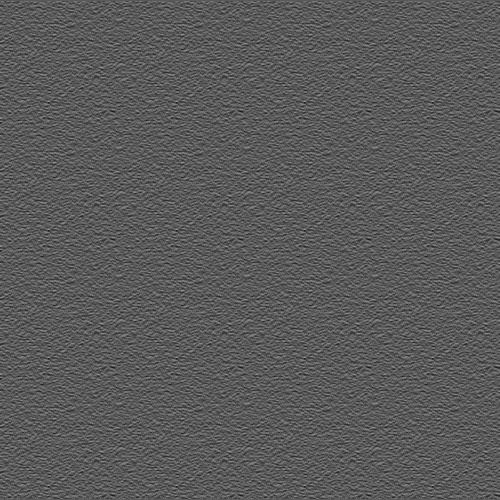 Report in the »Wochenspiegel« – click on picture opens new window! 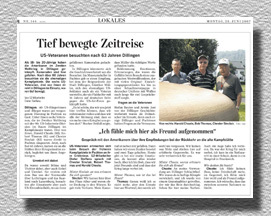 Report in the »Saarbruecker Zeitung« – click on picture opens new window!